We left Bangkok in late April, a few days after Songkran, Thai New Year, had ended. The Red Shirts had been protesting for at least a month when we left, and the situation was just starting to become strained. In one of our last days, we walked too close to the protestors and felt tear gas in our eyes. That was the night of the first deadly interaction between the troops and Red Shirts when a Japanese journalist was killed. The public transportation had been cut in certain sections of the city and the main shopping malls were closed. 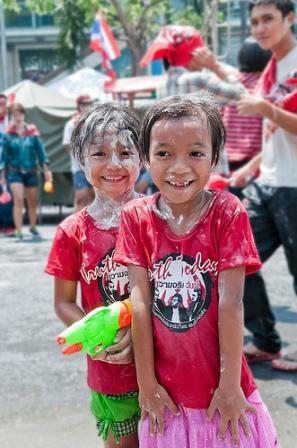 Songkran was the perfect respite from the rising tensions. For three days, the protesters and military stopped everything and celebrated the new year and the traditional festivities including water fights and smudging strangers’ faces with wet clay. The holiday is encouraged by the city government who ensures that families receive enough water to use in the festivities. Years ago, water was used to give the elderly a blessing in the new year. The transition has transformed into dumping buckets of water over everyone as a gesture of goodwill and mischief. Our landlords drove us in their pickup truck around the Silom and Sathorn districts where we threw buckets of water at people on the street. In return, the eager participants threw water at us and shot us with water pistols. Thais would run up to the truck and smash our cheeks and foreheads with wet clay and laugh. I don’t remember the last time I laughed that hard. The most painful were the revelers who had prepared ice water to throw at drive-by participants. I will never forget the feeling of an unexpected bullet of ice water down my back. The event was so fun–it evoked the summer days running through the sprinkler as a child. And so many people–young and old–were involved. It was impossible to walk around the streets and not be a participant, especially as a farang–foreigner. A portion of Silom road was shut down and people walked up and down, back to chest, shooting each other with water guns and baptizing each other’s faces with clay. Some firefighters had set up a fire truck that was gushing water over everyone’s heads and onto people on the street. We heard a rumor that there was an elephant spurting water over revelers on Khao San road. This was just before the tensions escalated between the Red Shirts and the military. In fact, before Songkran, the military members were good naturedly cajoling the protesters. It seemed that the soldiers were trying hard not to apply pressure against the protesters. It was time for us to leave Bangkok and the tensions with the protest only solidified our decision. It is difficult to read the reports of the violence in what is essentially our old back yard, only five blocks from our rented apartment. The life in this district is usually not like the warfare you imagine with the Red Shirts setting tires on fire and creating bamboo stick barracades. Bangkok today has many more high-rise condominiums and much more luxury than the city I knew 15 years ago, but is plagued by its dysfunctional politics. Is there any other city in the world today that has so many cloth-napkin restaurants, spas — and periodic grenade attacks? How many other world capitals have streets filled with fleets of luxury cars and armies of protesters apparently willing to die for their convictions? On Friday alone, 16 civilians were killed in clashes with the military that took place a few hundred yards from my apartment. The Thais are known as some of kindest and friendliest people in the world. It is painful to see them live in fear and violence like the recent events. Songkran sounds like it was great fun, and as you mentioned, a relief from the political tension between the military and the protesters. Admittedly, I don’t know too much about the politics of the region, but I never thought of Thailand as a place plagued by political unrest. I hope that the Thai people find peace soon. I saw the news and thought about you. What a terrible thing that’s happening and like you said, in our back yard. Se que fue una decision dificil pero hiciste lo correcto en buscar seguridad y estar cerca de tu familia. Gracias, por tus palabras, Elisa. I remembered that you were there and I wondered how everything was going. I saw interviews with other foreigners living there and it seems like everyone is making the exodus home. I think you chose correctly. What a moving post! The comparison between what you experienced before you left and what’s happening now is really saddening. I’m glad you were able to part with the country on a mostly high note. I’d still love to visit Bangkok someday after the political unrest and violence calms down. I left a long comment and it looks like wordpress ate it up–grrr! I’m glad you managed to get out safely, and that you enjoyed such a wonderful time at the new year’s festivities before you did. Thanks Ricki. It was a real treat getting to meet you in person. All the best in your next direction!! Glad you had a good time, but I’m even happier to know you left before things really went to he!! in a handbasket. Stay safe and come home soon, sweetie. I need decorating ideas on my new digs. Songkran is much like Holi then, the Hindu festival of colors. People apply colors on each other on this day, wet and dry and have a lot of fun! Though I never had heart for the full-blooded Holi in which there is so much color on one that he is no longer recognizable! Good to know there is another festival in the South East. It was a revelation. Thank You. Your blog is great! Keep it up! I will be a regular visitor. Thank you. I would love to experience Holi someday. I was just gonna say what Pankaj said about Holi. Very similar with everyone drenching everyone else for fun. Looks like fun, I can’t wait to go back to Bangkok for a longer stay. 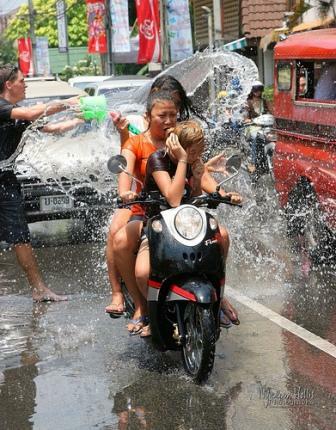 Reminded me of the days when I was in Bangkok for the Songkran festival.